It’s just 100 words (or fewer) so why is it so freaking difficult? You know what I’m talking about…the short bio or brief description that you need for social media platforms such as Twitter, Instagram, Pinterest and all the others. I always find it so much easier to have bio examples to follow, so here are some fill-in-the-blank templates for you to customize for your own short social media profiles. Pick and choose the parts that work for you. Twitter: 160 characters, which means only 20 – 25 words. Make each word count! 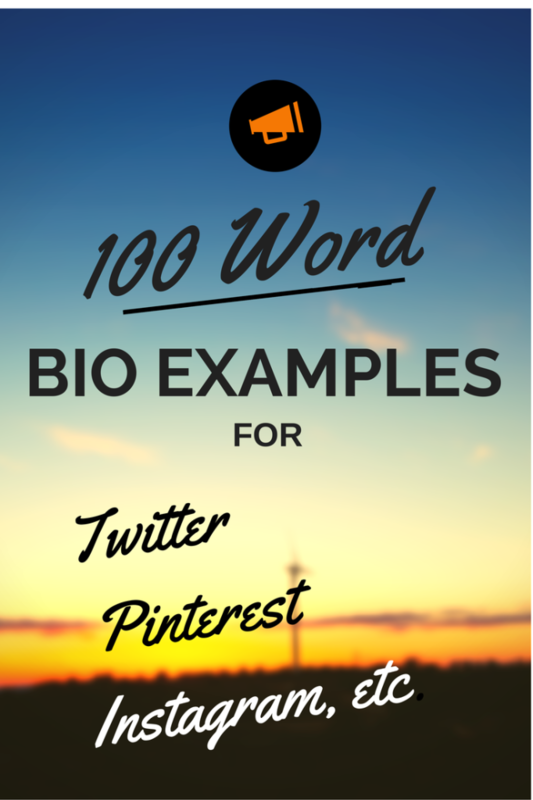 Pinterest: 200 characters, which translates into approximately 30 words. Instagram: 150 characters, or about 20 words. Before you get started though, you’re probably wondering if you should write in first-person (I am a …) or third-person (your name, such as “Barbra is a …”). In the past, experts would tell you that bios should always be written in third person. These days, particularly with informal social networks such as Pinterest and Instagram, first person is common. On the other hand, on professional networks such as LinkedIn you’ll normally see bios written in the more formal third-person voice. It all depends on whether you want to project a formal, business-like feeling (third-person), or an informal social feeling (first-person). In the example templates below, I used both first-person and third-person formats. Choose whichever works best for your needs, but keep it consistent throughout your bio. In other words, don’t switch back and forth from first-person to third-person. (your name) has always enjoyed starting and running businesses. In fact, by the time she/he was ________ (age), she/he had already ____________ . Soon afterwards, ___________ (your name) began a _________ and a ___________. Now she/he is the ________ (your title) of _________ (your business name), which __________ (short description of your business). I’m the owner/operator of ________________ (your business name, linked to your website). ___________ (your business name) provides ___________ (your service or product) to ____________ (your customers) so they can ____________ (what your customers do with your service or product). I got into this line of business in ______ (year) when _________ (tell how you got started). My favorite part of having a ___________ (type of business) business is ____________, because it allows me to ____________ (why you enjoy it). Also, _________________ (a part of your job) can be a lot of fun! When I’m not working on ___________ (your business name, linked to your website), I like to _________ (your hobbies). I’m a _________, ________ and _________ (list three things that describe you, e.g. small business owner, writer, cat lover, devoted father) from __________ (list the general area you live in, e.g. country, state or city, but obviously: don’t ever give your address). I think of myself as a _______ (your temperament e.g. quiet, bubbly, shy, outgoing) person, although I’ve also been known to __________ when __________ . The things I love most in life are ______, _________ and ________ (list your favorite things, e.g. hanging with friends, my relationship with God, photography, cycling, family, my kids). I’ve been ___________ (your profession or hobby) for ____ years, and I really love it. My idea of the perfect day would start with _________. And then I’d _______ and finish off by ________. The kinds of people I’d like to meet are ones who are ________ and ________. That’s important to me because __________.